Dr. Jaime Fernandez-Fernandez has a B.A. in applied science in exercise and sport science, and a PhD in exercise physiology. He is an assistant professor and researcher at Miguel Hernandez University of Elche in Spain. He is an author of several national and international articles related to strength and conditioning in sports. He has been working as a strength and conditioning specialist for tennis players (top 100ATP/WTA players) and sport science and coaching consultant for junior as well as professional tennis players for more than 15 years. 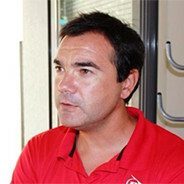 He is also sport science and coaching consultant for different international tennis federations (i.e., Norwegian tennis association), coordinator of the sports science and coaching area of the Spanish tennis federation (RTET), and advisory board member of the international tennis performance association (ITPA). He has a lot of experience as a speaker in national (RFET national congress) and international events (ie., Tennis Europe Congress; ITE World Coaches Conference).